August 28 — Saint Augustine of Hippo, Bishop and Doctor - Memorial - My Catholic Life! The mighty African Saint Augustine climbed the heights of thought, stood upright on their peaks, and turned toward Rome, as his figure slowly cast a long, deep shadow over the entire globe. As a Christian thinker, he has few equals. He is the saint of the first millennium. Augustine was born in the small Roman village of Tagaste, in northern Africa, to a minor civil official and a pious, head-strong mother. Tagaste had no swagger. Its simple people were bent over from working the land since time immemorial. The great African cities hugged the Mediterranean coast, far from Tagaste, which was cut off, two hundred miles inland. When he was a boy, Augustine imagined what the far-off waves of the sea were like by peering into a glass of water. When he was twenty-eight, he descended from his native hills and sailed for Rome to find himself, God, and holy fame. When he returned to Africa many years later, it was forever. The hot young African had matured into a cool spiritual father. He was now their bishop, loving and tirelessly serving the open, forthright townsmen that were his natural kin. Augustine is the world’s first great psychologist. He does self-reflection and analyses ages before Saint Ignatius and perceives unconscious motivations centuries before Freud. The painfully self-aware, tell-you-everything, what-are-you-hiding, hyper-modern psyche of today is deformed Augustinianism. It took a long time for the future to catch up to him. Augustine does so many things first, does them better, and does them as a Catholic. The Confessions changes the answer to the perennial question “What really happened?” from the outside to the inside. With the historical details left to the side, he self-investigates his early childhood, his unsatisfied father hunger, the emotional darkness caused by the death of friends, his enduring guilt for stealing some pears, his complex love for his mother, and how hard it is…how hard…to leave the woman he has loved for fifteen years. They have a child together. But Augustine must let her go. He must move on, and he does. She is the Confessions’ mysterious character. He never even gives her name. Reading other great theologians, one knows almost nothing about them, their friends, or their personal thoughts or desires. Reading Augustine, you get the man in full. He is concerned with relationships, that of his to God and his mother, and that of others to himself. He would start his letters with dulcissimus concivis—My dearest friend. And he meant it. He was a highly educated scholar, a great letter writer who worked in the close orbit of the Roman imperial court, and a thinker who most opened the intellectual path the Church would walk until the scholastics of medieval times introduced Aristotle to Christian thought. When Augustine turned his head from the beauty of the senses toward the holy beauty of God, his privation was more than an absence. It was a total commitment. 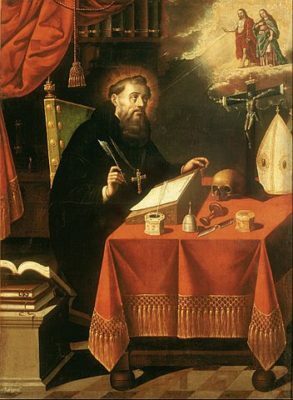 In the second phase of his life, Augustine placed the heavy cross of routine pastoral care on his shoulders. He became a working bishop and excelled at his role. This complex man, this highly fruitful, working intellectual, asked to be alone in his room when death finally came for him in his seventy-fifth year. Saint Augustine, may our own examination of conscience be like yours—continual, honest, and Christ centered. You achieved a high level of self-awareness not for its own sake but to prune from your soul all sin. May we be as self-focused, and as God focused, as you were. ST. AUGUSTINE was born in 354, at Tagaste in Africa. He was brought up in the Christian faith, but without receiving baptism. An ambitious school-boy of brilliant talents and violent passions, he early lost both his faith and his innocence. He persisted in his irregular life until he was thirty-two. Being then at Milan professing rhetoric, he tells us that the faith of his childhood had regained possession of his intellect, but that he could not as yet resolve to break the chains of evil habit. One day, a however, stung to the heart by the account of some sudden conversions, be cried out, “The unlearned rise and storm heaven, and we, with all our learning, for lack of heart lie wallowing here.” He then withdrew into a garden, when a long and terrible conflict ensued. Suddenly a young fresh voice (he knows not whose) breaks in upon his strife with the words, “Take and read;” and he lights upon the passage beginning, “Walk honestly as in the day.” The battle was won. He received baptism, returned home, and gave all to the poor. At Hippo, where he settled, he was consecrated bishop in 395. For thirty-five years he was the centre of ecclesiastical life in Africa, and the Church’s mightiest champion against heresy; whilst his writings have been everywhere accepted as one of the principal sources of devotional thought and theological speculation. He died in 430. Reflection.—Read the lives of the Saints, and you will ill find that you are gradually creating a society about you to which in some measure you will be forced to raise the standard of your daily life.